Sometimes, a client will come to me with a simple color combination as their inspiration. 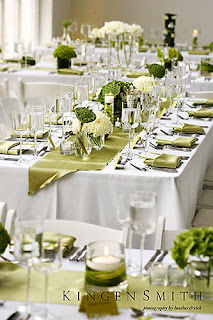 For this favorite client, she wanted her early summer wedding to feature crisp apple green hues and bright white accents. The designs were sleek and simple, but made a statement in the urban setting at Prairie Productions. The use of long, banquet-style tables created an interesting architecture in the room and allowed the minimal floral details to create a visually impressive statement, lined down the center of the table. A stylish client of mine came to me via the lovely wedding planner Susan of Big City Brides with the hopes of having her wedding feel like a garden-inspired, Frenchy Feast. Before writing her proposal, I put together a quick inspiration board (pictured below) for her based on her desired look. This helped to ensure we were both on the same page, visually, before proceeding to the sample mock-up of her centerpieces. Varied vintage silver vessels overflow with gardney flowers like open roses, peonies, ranunculus, anemones and lisianthus to name a few. Unruly jasmine vine, grapes and plums tumbled from the arrangements to the tabletop. A charming spray rose was tucked into each knotted guest napkin. I framed each beautiful window with rich eggplant curtains, lending an intimate feeling to the affair. It’s the little touches I adore! We had unexpected, petite designs tucked in various nooks around the setting to create a more homey feeling. Here a silver footed bowl hosts a heaping mound of fresh fruits, gently punctuated with raspberry colored spray roses. 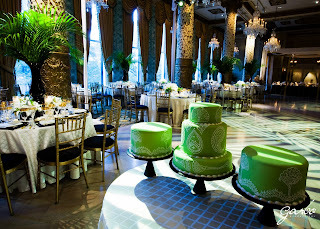 This Drake Hotel wedding had a bold, graphic color palette of Green/White/Black. Some of the tables featured elevated centerpieces, designed in black lacquered vases hosting a canopy of rich palm fronds – lending her desired ‘Tropical Elegance’ vibe. Additionally, Frank and I sourced the same palm patterns as those in the classic movie Casablanca and had them projected onto the dance floor for added texture and drama in the old, glamorous space. The wedding was stunning, the bride and groom were thrilled and we pulled off the perfect design for her Kelly Wearstler/Tropical Elegance/40’s Glamour inspiration! Thanks to my friend and wedding planner Frank Andonoplas for his partnership on this wonderful wedding. One of this client’s inspirations was her favorite interior designer: Kelly Wearstler. A few of Wearstlers’ trademark styles spoke to me and my wonderful planner friend Frank Andonoplas: Kelly’s use of eclecticism, old world glamour – showcased in modern manners and graphic designs with bold color combinations. I was able to create a wedding design that incorporated these fantastic looks. ~The head table sat 14 people; the bridal party. We used long, rectangular shaped tables lined end-to-end to create a more dramatic contrast to the sea of round tables. ~One of the most impressive pieces of the wedding was the custom designed canopy – created to house the head table and make a statement in the grand room (pictured above). ~Because the room is so ornate, I decided to execute the canopy in a more graphic, geometric style. 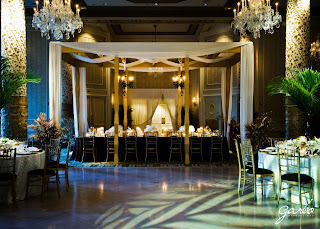 The canopy was woven with flowy fabrics and featured a pair of black crystal chandeliers, twinkling above guests as they dined – another modern and graphic contrast in the luxe, detailed room. 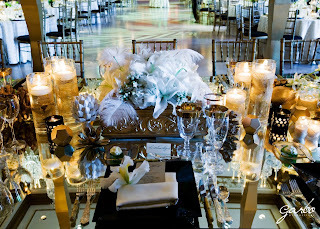 ~The head table (above) featured a custom mirrored tabletop that reflected the abundance of candlelight and highlighted the chandeliers suspended overhead. I always encourage clients to use ‘low’ designs on their head table – all eyes will be on the bride and groom! Guests love to see their reactions to toasts etc. For their long, rectangular table, I created a rolling landscape of varied, eclectic elements stretched down the middle of the table. ~Adding to the eclectic feel, I included elements (strategically chosen, but seemingly random!) like gold lacquered geometric pieces, white porcelain sculptures, graphic black votive cups, varied forms and heights of candlelight and fresh, living succulents and palms tinted gold for an unexpected look. Before I meet with a client for the first time, I ask them to bring any inspirations they have for their wedding design…It doesn’t always have to be literal (like a centerpiece they saw in a magazine) – and is often times a bit more abstract…A favorite vintage purse, a piece of artwork. Something that speaks to them (they often don’t know why) or captures the essence of what the bride is looking for on her wedding day. I’d like to share a few of my client inspirations and show how I translated their thoughts into the form of a wedding design. 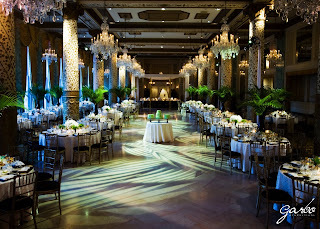 A favorite client, got married in the Gold Coast Room at the iconic Drake Hotel. She came to me with a few inspirations. I will post a few more images of this wedding taken by the wonderful Garbo Productions. I am obsessed with charm. With beauty. With inspiration. 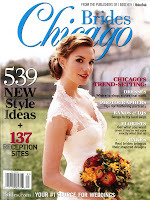 As a wedding designer in Chicago, my job revolves around working with clients, taking baby bits of information and translating their seemingly fragmented thoughts and ideas into a cohesive, inspired wedding/event design. After recently planning and designing my own dreamy wedding, I have found that I crave the hunt and the process of uncovering beautiful details and designs that can be woven into an occasion. I want to continue the search and share all things beautiful, charming and inspired and so – The Art of the Occasion is born.